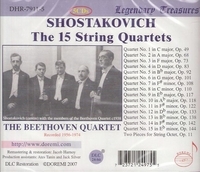 "This is a priceless treasury of the complete string quartets of Shostakovich recorded in the early 1960s by the legendary Beethoven String Quartet. This ensemble premiered all but two of the fifteen Shostakovich quartets. "...[The Beethoven Quartet's] view of this cycle carries special authority. Collectors who were lucky enough to get the old Melodiya LPs from the 1950s and 1960s, and who still treasure them, will welcome their reappearance...no other group was closer to Shostakovich's mind." "Formed in 1922 as the Moscow Conservatory Quartet, the Beethoven got its permanent name in 1931 along with recognition as the top Soviet quartet — seven years before Shostakovich wrote his first. Their final rehearsal of that work so impressed him that they became partners. These superior renditions didn’t receive their due contemporaneously. In the LP era, they were taped at the Ostankino radio studios shortly after the premiere of each quartet with the composer in attendance. Produced as needed over a lengthy period (1956-74) rather than like a contemporary intégrale (en masse) seems a point in their favor, at the risk of obscuring the achievement. As expected, Doremi’s transfers are worlds more gracious and revealing than the rough CDs of this material in the short-lived Consonance label issued in 1994."